As people smarter than myself have already pointed out, taking part in a Kickstarter funding campaign is like buying a present for your future self: by the time it arrives, you’ll have forgotten that you paid for it, and be pleasantly surprised that it showed up at all. That and the feeling of actually participating in a product rather than just buying it are all the reasons you need to know why Kickstarter is still huge. To date, I’ve participated in five Kickstarter campaigns, mostly for small amounts. In each case, it was clear that I’d be waiting a long time for the results, something I didn’t mind at all. Well, in recent months my currently impoverished self has been reaping the benefits of my affluent former self, in that two of the results have shown up (in one form or another). 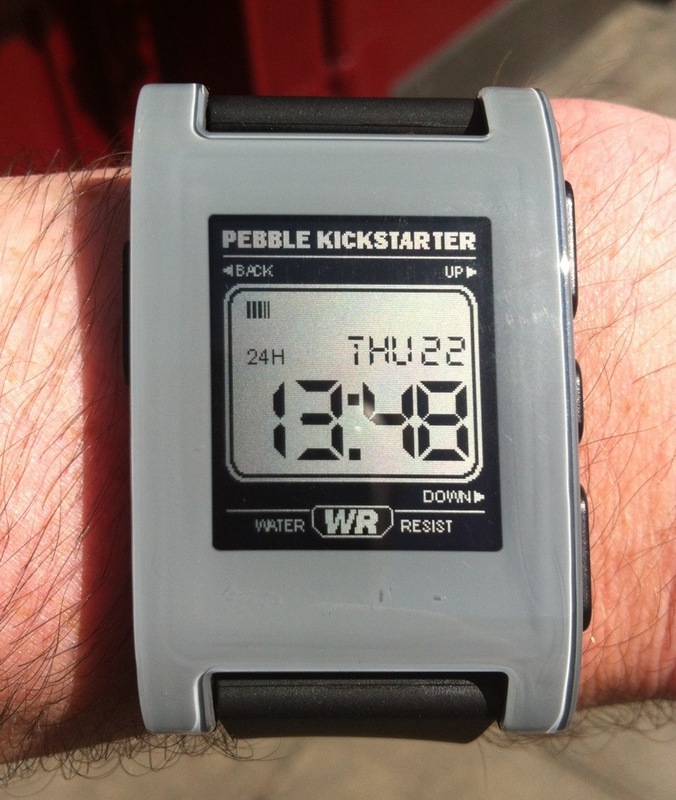 My biggest Kickstarter contribution to date was for one of the site’s most famous campaigns: the Pebble ePaper watch. A customisable bluetooth watch for Android and iOS phones, the Pebble raised $10,000,000 through Kickstarter, far above an original funding goal of $100,000. Due to the fact that I opted for a grey watchface rather than black, red or white, mine took a little longer to arrive than it might have otherwise, but a few weeks ago I wrested it from the hands of Irish customs and onto my wrist. For the first wave in a new breed of smartwatches (Kickstarter is already hosting its more ambitious next-gen brethren), the Pebble has a definite retro, plastic feel to it. Which is not to say it’s not solid: the plastic case keeps it watertight while allowing charging through a USB lead and keeps the body light despite the its bulk. The ePaper screen is basic but readable, with a motion-activated backlight, and can be modified with a multitude of watchfaces. Figuring out how to do so can be a bit of a chore: the online setup process is straighforward enough, but for more expansive options, you’ll need to use your phone’s web browser and the app that manages the Pebble itself. In use, the Pebble is a handy accessory. I often don’t hear my phone when it’s in my pocket, but I can feel the Pebble’s vibration on my wrist without a problem, alerting me to calls, texts and mails. I can even read the mails and texts, or at least the first few lines of the mails, on the Pebble’s screen, though this only works in the moment—there’s no way to browse older messages. There are only three issues with the Pebble, all of them technology based. The first is that it drops the bluetooth connection occasionally. This is an issue because the Pebble isn’t a smartwatch. It’s a terminal for your smartphone, and lacking the connection, it can tell you the time in various pretty ways but not much else (there are game apps for the Pebble, but the chunky buttons don’t allow for sensitive control). The second issue is battery life. I’ve averaged around five days so far, which isn’t too bad for a bluetooth device, but the phone software doesn’t do a great job of indicating when you need to recharge, so there have been a couple of times when I’ve looked at my wrist and found a blank screen looking at me. Annoying, but some of those multitude of watchfaces promise to fix that issue. The last issue is probably the biggest one for Pebble: this is a first-generation device, cute and functional, but staring down the barrel of technological innovation. As stated, Kickstarter is already hosting second-generation devices, and Apple and Samsung look set to enter the space before long, bringing all their engineering know-how to the field. When that happens, Pebble’s retro looks may become all-too apt. For now though, I’m wearing a watch for the first time in a couple of years, and I’m more than happy with the present my former self bought me. Runkeeper functionality, message and call alerts and a variety of funky watchfaces. It may not be smart, but it sure is handy. I’m not sure how long it took to get through, as I wasn’t tracking it. The customs cost was €20-€30 if I recall correctly.